Did you know? Egg farmers treat social responsibility as a top priority. Rosemary Farm follows strict animal care and food safety guidelines, gives back to our communities and is a sustainability leader. So what is sustainability in the egg industry? Sustainability is primarily about acting in a way that ensures long-term viability for our farm operations. Every day, each choice we make defines our footprint – from how we care for our hens to how we are involved with our community and to how we treat the land. 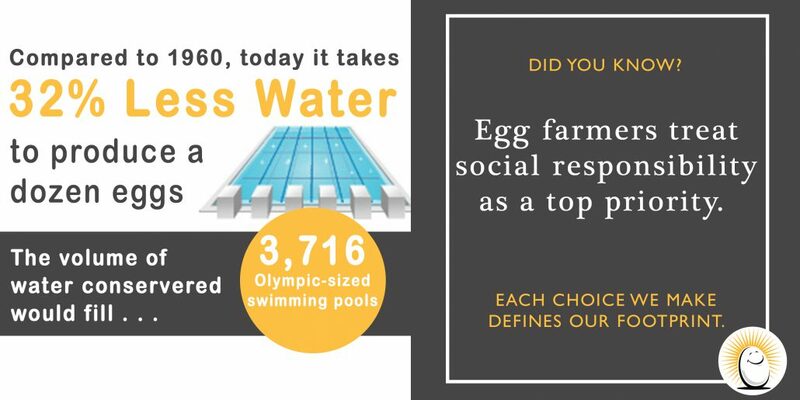 Sustainability is nothing new to the egg industry, but through generations of farming, we have been able to enhance our practices through innovations. Advancements in hen housing as well as efficiencies in feed, water and manure management have allowed us to significantly reduce our environmental footprint. Everything we do, from choosing a blend of nutrients to feed our hens to designing barns to house them, is centered on creating healthy, safe food for you and your family. These graphics via American Egg Board detail just how much our environmental footprint has reduced overtime. Rosemary Farm is proud to put social responsibility as a top priority and will continue to find ways to enhance the well-being of our hens, the production and quality of our eggs and how we give back to our communities and care for the environment.